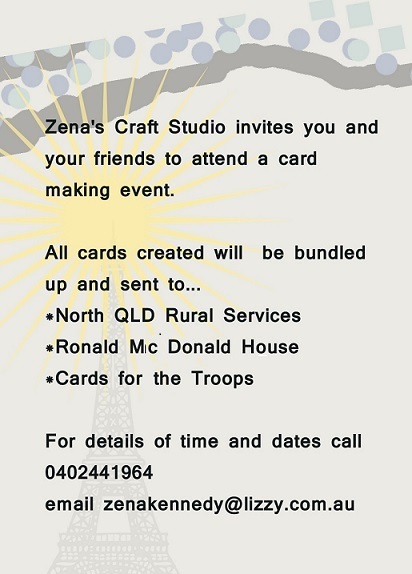 During our charity event last weekend one of the ladies at Zena’s table suggested that we should get together and make cards for the North Queensland Rural Family Support Services, as this was possibly another way we could help. We want to run with this idea and Zena has offered her studio to run these card making sessions. She has a few days and evenings planned. If you are keen to make some cards, then get in touch with her. You don’t have to be creative, as you will be guided every step of the way. Come join us! !